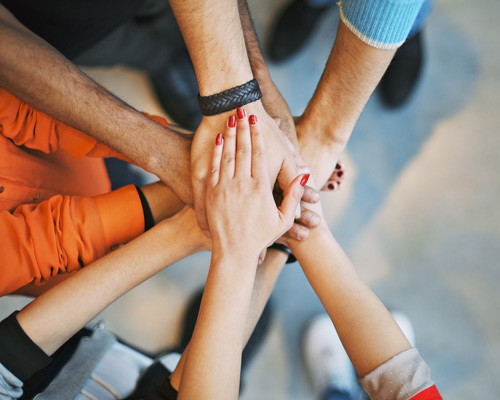 OLA cares Our passion for community goes beyond our work. 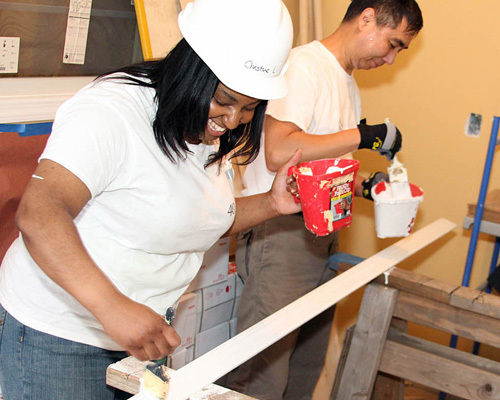 Join us as we participate, volunteer, and build a better planet to inhabit! OLA was a private campaign sponsor for the U.S. Marine Corps Reserve “Toys for Tots” Program this past December. 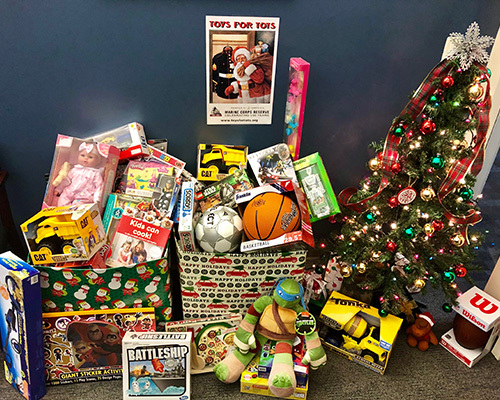 Our two collection boxes overflowed with toys and gifts generously donated by our employees throughout the month. The donations were picked up and distributed to needy children throughout the Westchester community in time for Christmas. If you are interested in learning more about the “Toys for Tots” Program, check out the website here for more information. 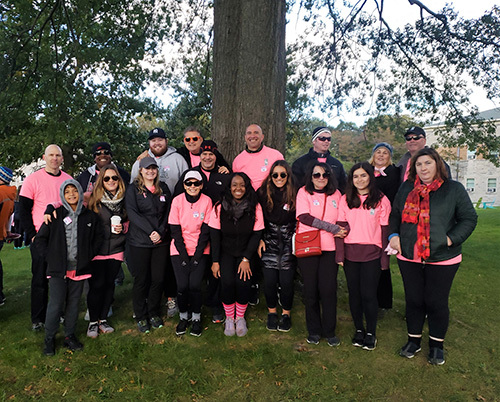 OLA sponsored a team of employees, families and friends at the American Cancer Society Making Strides Against Breast Cancer walk this October for the third year in a row. The 5k walk took place at Manhattanville College in Purchase, NY. In addition to the walk, OLA set up a donation page for the American Cancer Society, exceeding our fundraising goal once again. OLA gets ready for school! 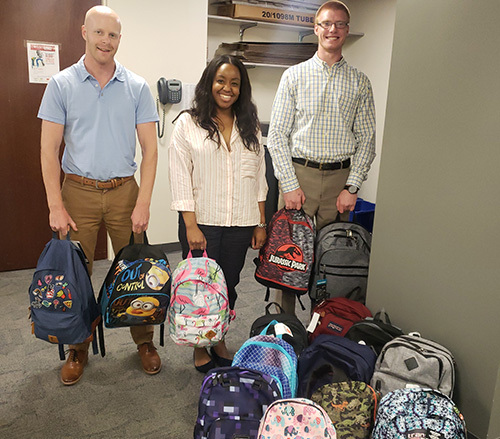 Working with Volunteers of America, the OLA team filled backpacks with school supplies for children in need. 2018 marked our 13th year participating in the fundraiser. 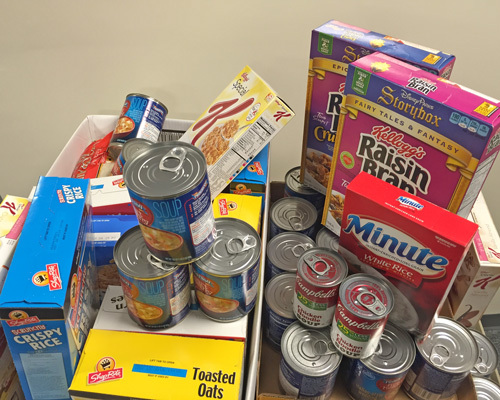 OLA participated in a Food & Fund Drive this month for Feeding Westchester (formerly Westchester Food Bank). Feeding Westchester has led the fight against hunger in Westchester County helping provide food to residents who are hungry or food insecure for over 29 years. Our office collected 134 pounds of nonperishable food items, as well as collected monetary donations online surpassing our goal. Learn more about Feeding Westchester and how you can donate on their website here. OLA hosted the Girl Scout Troops of Lakeland East and North Salem in our office on March 23 to showcase careers for women in engineering. Principal James Dolan, P.E. presented a slide show about our company and the engineering work we do. 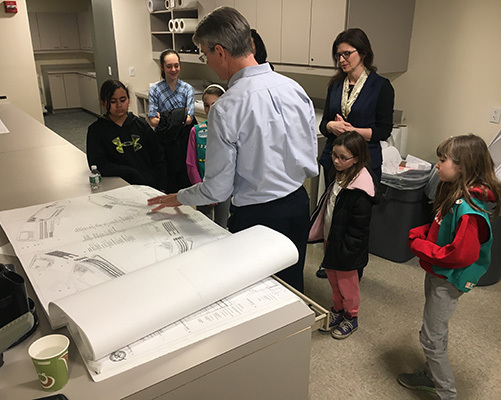 The girl scouts were then broken up into groups with engineers Christine DiSisto and Samantha Canosa to learn about the different tools that engineers use on construction sites and in the office. The afternoon finished with a tour of the office. County Executive Robert Astorino launched a “Hurricane Relief for Puerto Rico” drive across Westchester County. 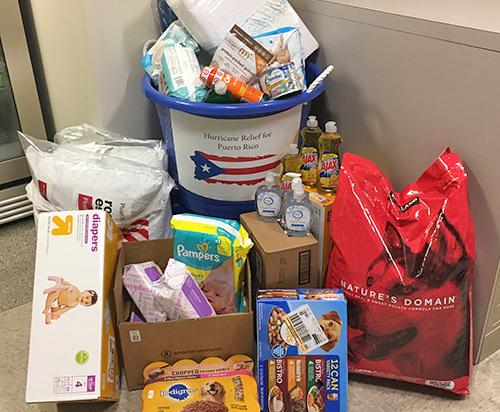 OLA employees participated in this drive to help the population of Puerto Rico impacted by the hurricanes in 2017 by collecting essential supplies that were shipped to the U.S. territory’s residents that were in need of assistance. The county continued collecting donations through December, and held a toy drive for Puerto Rico for Three Kings Day as well. 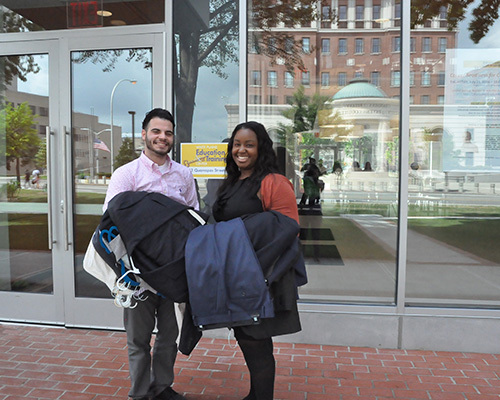 Recently opened on the ground floor of The Prelude in the White Plains Education Training Center, Career Closet provides free professional attire for underprivileged men and women entering or interviewing to enter the workforce. OLA held a clothing drive and collected business suits, pants and dress shirts from employees and clients to donate to Career Closet. If you would like to learn more about the White Plains Education & Training Center or Career Closet, please take a look at their website. 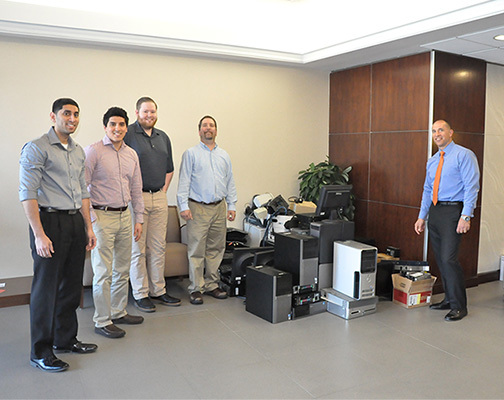 OLA teamed up with our Property Manager, Diamond Properties, in celebration of Earth Day by collecting old electronics and laser toner cartridges for recycling. Employees brought in old cell phones and computers from home, and OLA recycled many out of date computers, laptops and network equipment that were stored in the office. 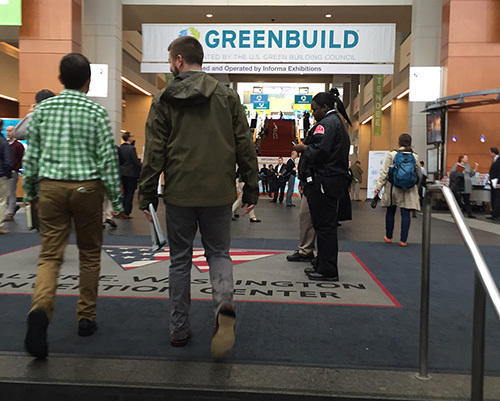 OLA continued its annual attendance to the largest green building conference in the world. Aligned with our passion for engineering better environments, team members enthusiastically participated in discussions, seminars, and demonstrations to continue to innovate and expand sustainable thinking. 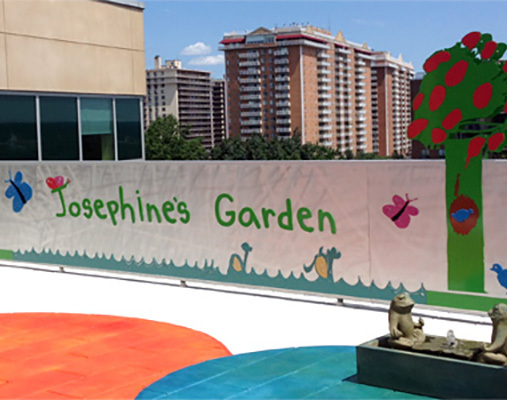 While being treated with a rare, malignant, high-grade brain tumor called atypical teratoid rhabdoid tumor (AT/RT), seven-year old Josephine dreamed to create an outside oasis for pediatric cancer patients at Hackensack Hospital. OLA’s team was inspired by Josephine’s mother, Heidi Hartung Rispoli, who fulfilled her daughters dream and created Josephine’s garden. Read the rest of their story here. 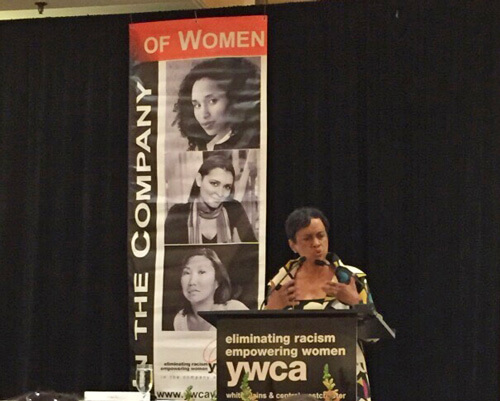 “We are called to help a generation of children and a generation of women to write their own story of hope and possibility.” Judge Glenda Hatchett inspired an audience of local companies, government officials, and community members at YWCA’s 7th annual In the Company of Women Benefit Luncheon.” OLA was proud to attend and support YWCA’s efforts to empower women and promote peace, justice, freedom and dignity for all. Visit http://www.ywcawpcw.org/ to learn more. 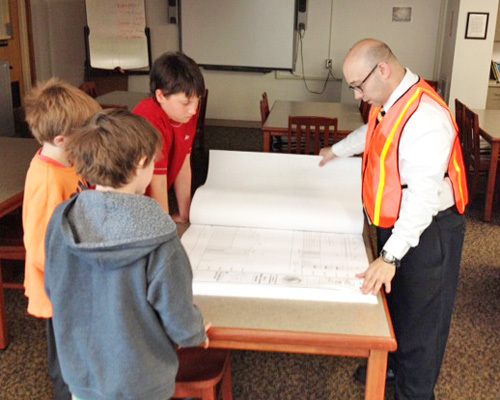 OLA Associate Energy Engineer, Jonathan Katz, P.E., C.E.M, LEED AP, visited Pierre van Cortlandt Middle School in Croton on Hudson. Presenting to all 5th grade classes, he discussed the power of engineering and answered questions about blue prints, energy usage, and hard hats! 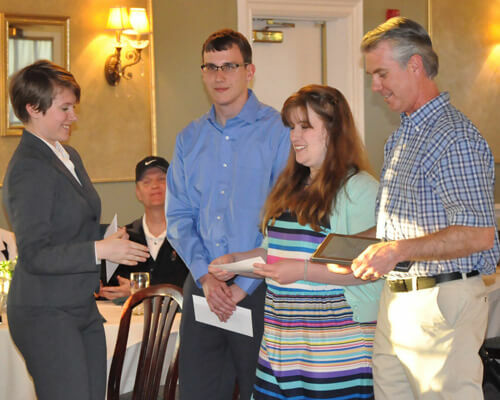 Joining with the ASHRAE Bi-State Chapter, OLA celebrated Earth Day by recognizing – and learning from – industry innovators. 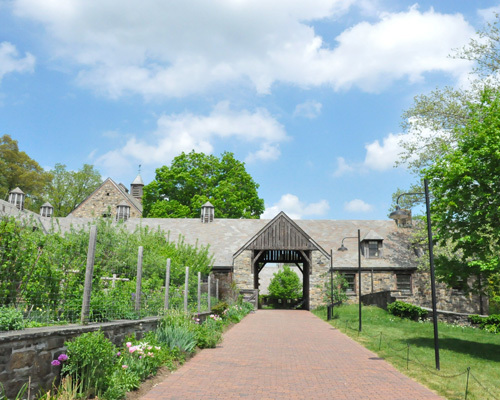 Presentations from Erica Helmns of Stone Barns, Hillary Brown, FAIA and Carl Ian Graham, PE provided stimulating discussions on how to further participation in the effort to protect our planet. 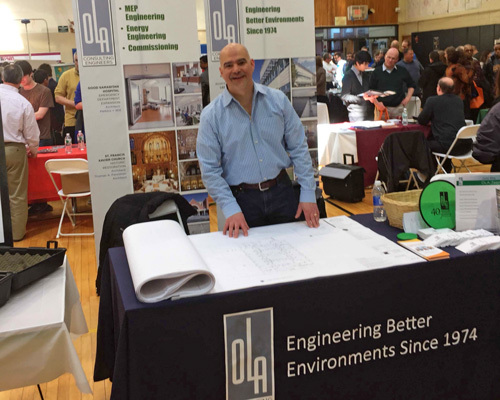 On March 22, 2015 OLA set-up in the gymnasium of White Plains High School to inspire the next generation of engineers. Our team rolled out blue prints and engaged in many conversations about the role mechanical engineers, electrical engineers, and energy engineers can play in changing the world. On Monday January 19th, Martin Luther King Day, the OLA team contributed to the Mount Kisco Interfaith Food Pantry’s mission of distributing groceries to 270 local families per week. 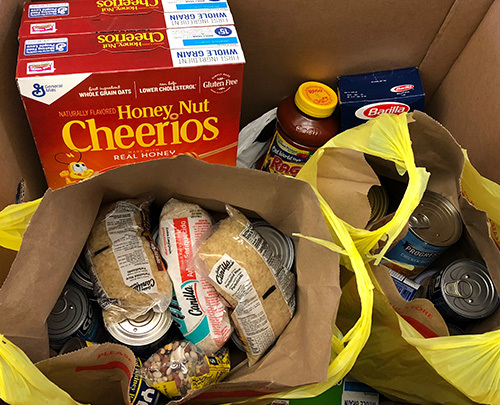 127 pounds of food balanced on our office cart, a full trunk, and a short drive later, OLA team members met a group of Food Pantry volunteers preparing deliveries. To learn more about the Interfaith Food Pantry or to donate, visit their website here . Want to join us? Have a suggestion for our next event? Email marketing@olace.com. We love hearing from you.